Delft Cybernetics is a research group that is part of the Control & Simulation section at TU Delft’s Faculty of Aerospace Engineering. Our group consists of a number of enthusiastic researchers who aim to develop objective and quantitative methods for measuring, modeling, and comparing human control behavior. In addition, we work on various cross-disciplinary applications that aim at better supporting humans in direct control of technical systems and vehicles. 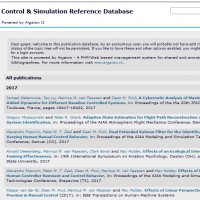 Download BibTeX keys and pdfs of many manual control papers. ©2019 Delft Cybernetics. All rights reserved.